(TibetanReview.net, Apr11, 2016) – In a unique tribute to Tibet’s exiled spiritual leader, the Dalai Lama, on his attaining 80 years of age and for his contributions to Tibet, India and the rest of humanity, veteran Indian journalist and decades-long observer of the Tibetan struggle Mr Vijay Kanti opened on Apr 7 a week-long photo exhibition on Apr 7. 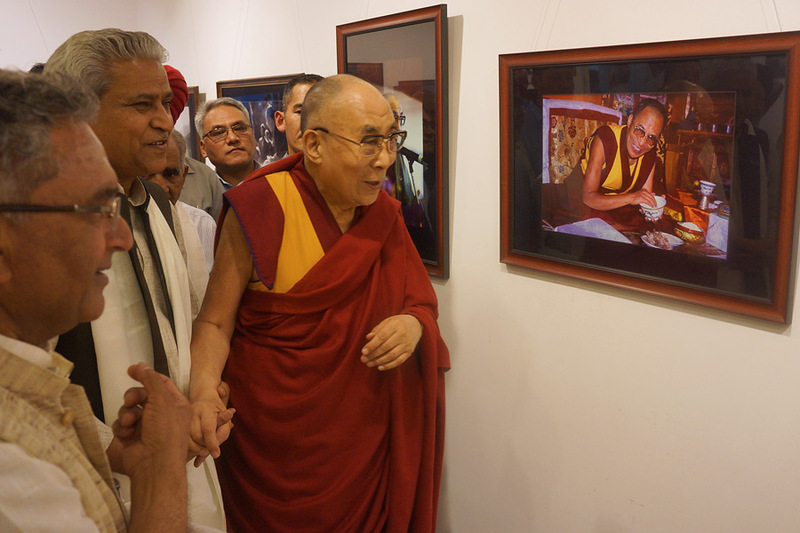 The exhibition – ‘Thank you Dalai Lama’ – is being held at the All India Fine Arts and Crafts Society (AIFACS) in New Delhi, locate opposite the parliament house. The Dalai Lama visited the exhibition on Apr 10 afternoon. He was accompanied by the BJP General Secretary Mr Ram Lal and columnist and BJP Rajya Sabha MP Mr Balbir Punj. The exhibition features around 300 photographs as well as slideshows based on over 1000 imagers. Together they constitute a photo-study of the Dalai Lama and the rebirth of the Tibetan civilisation in India, according to Mr Vijay. Mr Vijay says the exhibition is his lifetime visual tribute to the success story of a peaceful and brave refugee community; its monk-leader, the Dalai Lama; and their magnanimous host, the people and Government of India. To Mr Vijay the exhibition is the concluding event of a five-year series of mega photo-exhibitions that he started under the theme of ‘Buddha’s Home Coming’ which opened in Mar 2011 in Barcelona, Spain. Subsequent exhibitions were held in New Delhi, Chandigarh, and Sydney. Those who attended the opening of the current New Delhi exhibition included the Speaker of the Tibetan Parliament-in-Exile Mr Penpa Tsering, Deputy Speaker Khenpo Sonam Tenphel, and two other members of the parliament-in-exile. It is being curated by Mr Akshat Kranti Mahajan, a well known fashion photographer.